KNOXVILLE - Although a turtle's home may be on its back, some North American turtles face an uncertain future as a warming climate threatens to reduce their suitable habitat. A new study that reconstructs the effects of past climatic changes on 59 species of North American turtles finds that the centers of the turtles' ranges shifted an average of 45 miles for each degree of warming or cooling. While some species were able to find widespread suitable climate, other species, many of which today are endangered, were left with only minimal habitat. Species in temperate forests and grasslands, deserts, and lake systems, primarily in the Central and Eastern US, were more affected by climate change than species occurring along the Pacific Coast, in the mountain highlands of the Western US and Mexico, and in the tropics, according to the study published today in the journal PLOS ONE. The study integrates data from more than 300 published studies on turtle physiology, genetics, and fossils with new models of species' response to climate-change cycles over the last 320 millennia to draw its conclusions. During this timeframe, Earth passed through three glacial-interglacial cycles and significant variation in temperature. 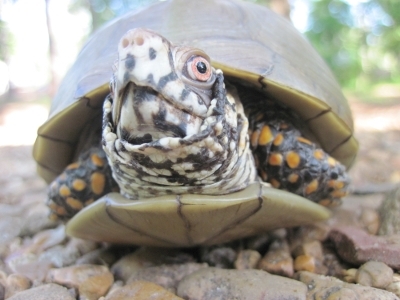 "By studying how turtles responded to these climate cycles, we can learn about regional differences of the impact of climate change, how climate change differently impacts species, and how climate has influenced evolution," said co-lead author Michelle Lawing, a postdoctoral fellow at the National Institute for Mathematical and Biological Synthesis. Quantifying niche conservation in historical time scales is crucial to estimate future extinction risks due to climate change, explained co-lead author Dennis Rödder, curator for herpetology at the Leibniz-Institute for Terrestrial Biodiversity Research at the Zoologisches Forschungsmuseum Alexander Koenig in Bonn, Germany. "This study, which for the first time comprehensively integrates all available information for the majority of all North American turtle species, provides profound evidence of how global warming will affect the genetic architecture of the turtles," Rödder said. The research suggests that the rate of climate change today is much faster than the turtles' ability to adapt naturally and evolve to tolerate the changes. Turtles will have to continue to shift their geographic ranges to keep up with the changing climate, yet new real estate for the turtles might be running out. 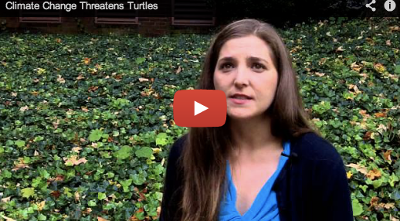 In this Science Minute from NIMBioS, Dr. Michelle Lawing explains how climate change threatens turtle habitat. "In the past, turtles have coped with climate change by shifting their geographic ranges to areas with more compatible climates. However, it is more difficult for modern turtles to do that with today's managed waterways and agricultural and urban landscapes," said co-author David Polly, professor of geological sciences at Indiana University. More than half of the world's approximately 330 species of turtles and tortoises are threatened with extinction due to illegal trade and habitat loss, according to the Red List maintained by the International Union for Conservation of Nature. Turtles and tortoises, which evolved about 220 million years ago, are at a much higher extinction risk than many other vertebrates, paralleled only by primates, according to the IUCN. Many of the most threatened turtles and tortoises are in Asia.